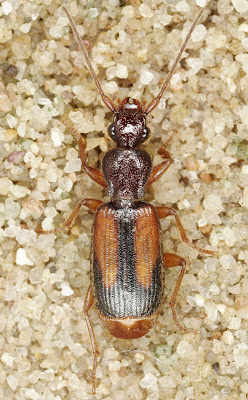 European zuphiin Polystichus connexus, by Cristoph Benisch. The subject of today's post is a group of ground beetles (Carabidae) that has been treated in the past as the subfamily Zuphiinae, but seems to now be more commonly treated as a supertribe Zuphiitae within the Harpalinae. Whatever their appropriate formal name, the zuphiites are distinguished by a relatively long and thick scape (the first major segment of the antennae) and spination on the first stylomere of the female's ovipositor (Ball 1985; Ober & Maddison 2008); the clade is also supported by molecular data (Ober & Maddison 2008). Many zuphiites also have a relatively narrow pronotum (noticeably longer than wide) and truncate elytra. Species of Zuphiitae are found around the world, primarily in the tropics, with known centres of diversity in Australia and the Neotropics (Baehr 1985). Diversity in Asia and Africa is supposedly lower but, as most of the Australian taxa appear to be ultimately derived through immigrations from Asia (Baehr 1985), it would not be at all surprising if this distribution was biased by higher levels of study in the former continents*. *Though 'higher level of study' is definitely a relative term: the Australian fauna, for instance, seems to owe its recognised diversity overwhelmingly to the work of Martin Baehr alone. 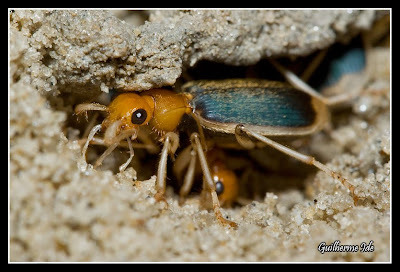 The galeritin Trichognathus marginipennis, photographed by Guilherme Ide. Within the Zuphiitae, current classifications recognise the tribes Zuphiini, Anthiini, Galeritini, Dryptini, Helluonini and Physocrotaphini, though the monophyly of some of these tribes is not firmly established (Ober & Maddison 2008). The Zuphiini are distinguished by a particularly long scape, while the Galeritini possess asymmetrically dilated tarsi in the males (Baehr 1985). Baehr, M. 1986. Revision of the Australian Zuphiinae. 6. The genus Planetes Macleay. Supplement to the other genera (Insecta, Coleoptera, Carabidae). Spixiana 9 (2): 151-168. Ball, G. E. 1985. Reconstructed phylogeny and geographical history of genera of the tribe Galeritini (Coleoptera: Carabidae). In: Ball, G. E. (ed.) Taxonomy, Phylogeny and Zoogeography of Beetles and Ants: A volume dedicated to the memory of Philip Jackson Darlington, Jr. (1904-1983) pp. 276-321. D. W. Junk Publishers. Ober, K. A., & D. R. Maddison. 2008. Phylogenetic relationships of tribes within Harpalinae (Coleoptera: Carabidae) as inferred from 28S ribosomal DNA and the wingless gene. Journal of Insect Science 8 (63): 1-32.